Do- ahead, prep ahead, make in advance… these are the magic words when it comes to planning any break fast feast following Yom Kippur. If I have to do more than pull platters from the refrigerator or slip a casserole into the oven, I’m simply not up for it. Along with kugels and bread puddings, smoked fish and juicy fruit, I yearn for vegetable salads on the buffet. I don’t mean sliced tomatoes and onions to go with my bagels and nova. Yes, I want them, too but I yearn for something seasonal and local like this do-ahead corn salad lightly coated in a Peruvian spinach based dressing. Your taste buds may have been napping all day but they’ll wake up and sing once they taste this aromatic gathering of flavors and textures. For more break-fast suggestions, including an array of unexpected dairy kugels, click the holidays tab above and scroll to Yom Kippur break fast. You’ll find it all there. Wishing you an easy and meaningful fast. 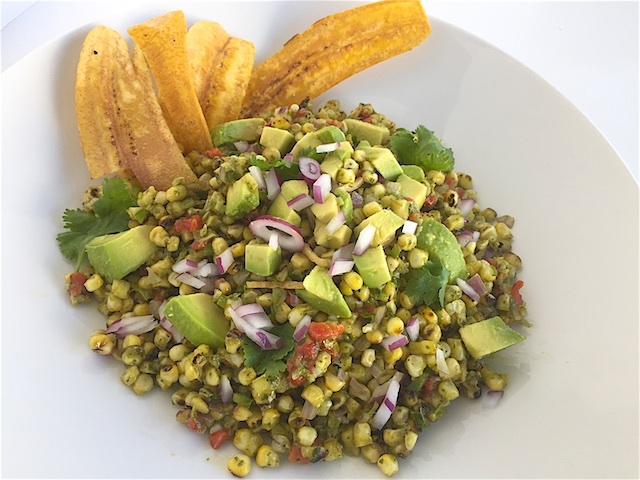 This end of summer/early autumn salad highlights crisp corn and creamy avocado lightly dressed in a savory dressing with early season spinach as its nutritious base. Make this salad ahead and keep it in your refrigerator for up to 5 days in an airtight container. Now that’s convenient! Remove the husks from the corn and place the cobs on a hot grill. Turn to rotate so that all sides are grilled evenly and nicely charred. Take off and let cool. Take a knife and cut the corn off the cobb into a bowl. Then mix with the roasted red pepper, scallions, red onion, jalapeno, avocado, Peruvian pesto, EVOO, lime zest and juice. Season with salt and pepper. Place all ingredients except for the heavy cream into a blender and puree until smooth. Next, pour into a small saucepot over high heat and bring to a boil. Cook until slightly thickened, about 3 minutes. Turn off the flame and stir in the heavy cream. Season with salt and pepper and let cool. If making this salad in advance, toss with pesto dressing just before serving.